In a period of little over a year, the High Court of Australia delivered five judgments of particular importance in the context of migration law and administrative law more generally. This article explores in detail the reasoning of the High Court in each of these decisions and, given that the decision of the court below was overturned on each occasion, the divergence in opinion between the courts. The article will attempt to ascertain whether there has been a significant departure from previous jurisprudence by the High Court under Chief Justice French in respect of the nature of jurisdictional error, the importance of codes of procedural fairness in statutory merits review schemes and in the interpretation of legislation governing merits review tribunals more generally. In the s 501, and the closely-related criminal deportation, jurisdiction, the Administrative Appeals Tribunal is considered to be far too independent. Using the power under s 499 of the Migration Act 1958 (Cth), successive ministers for immigration have issued three legally-binding directions, namely Directions No 17, No 21 and No 41, with the intention of influencing Tribunal decision making. In contrast to its predecessor, Direction No 17, Direction No 21 was lawful but considered to be unjust for failing to include considerations such as the non-citizen’s length of residence in Australia. Direction No 41 followed, marking a significant shift in government policy, by seeking to redress the previous imbalance. I reviewed all s 501 cases heard and determined by the Tribunal in accordance with Direction No 21 over a five-year period as well as recent decisions made under Direction No 41. I found that while Directions shape Tribunal decision making, due to the generality of the language of the Directions, the flexibility of fact finding and the opaqueness of reasoning, there is sufficient scope within the decision making process to enable the Tribunal to independently arrive at the preferable decision. However, if the government does not abide by the Tribunal’s decisions, regardless of the outcome, its decisions stand to “fall into disrepute”, bringing into question the Tribunal’s role in our system of administrative justice. Juries in criminal law trials are said to represent the bulwark of justice in Australia. The jury is said to bring with it the representation, quite directly, of the wider community to the fundamental promotion of justice. Yet, interestingly, the jury is prohibited from providing reasons for their decision. Such a prohibition is said to rest upon many arguments, one of which is the impediment of the proper administration of justice. Despite the foregoing, there has been a growing trend in recent years that administrators provide reasons for their decision, so as to promote the administration of justice and ensure justice is not only done, but is also seen to be done. Such is said, quite rightly so, to demonstrate transparency and open justice. 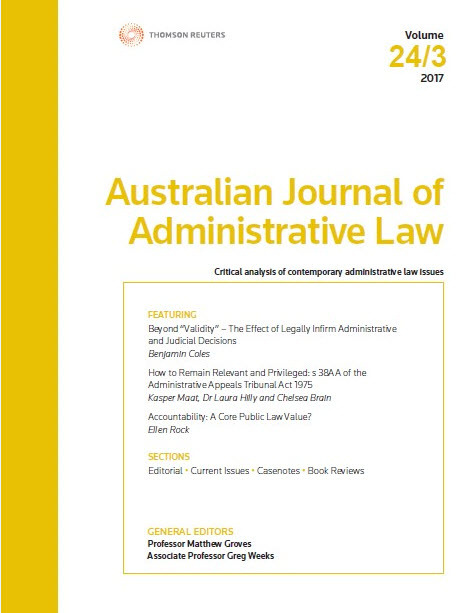 This article argues that various administrative law principles not only seriously call into question the jury secrecy principle, but also suggest that the prohibition of the provision of reasons for a decision by the jury is inconsistent with dictates of proper open decision making. For the pdf version of the table of contents, click here: AJ Admin L Vol 18 Pt 3 Contents.